Oberursel, September 17, 2018 – As a recent study by the OTRS Group shows, employees spend a large part of their working time on administrative activities without being able to devote themselves to their core tasks. Oberursel, September 17, 2018 – As a recent study by the OTRS Group shows, employees spend a large part of their working time on administrative activities without being able to devote themselves to their core tasks: 82 percent use half an hour of their workday to search for the information they need to accomplish their work. Over 23 percent of those surveyed need more than two hours a day. Specifically, email seems to distract workers from their actual tasks: Over 32 percent indicate that they need an average of an hour a day to sort their email. 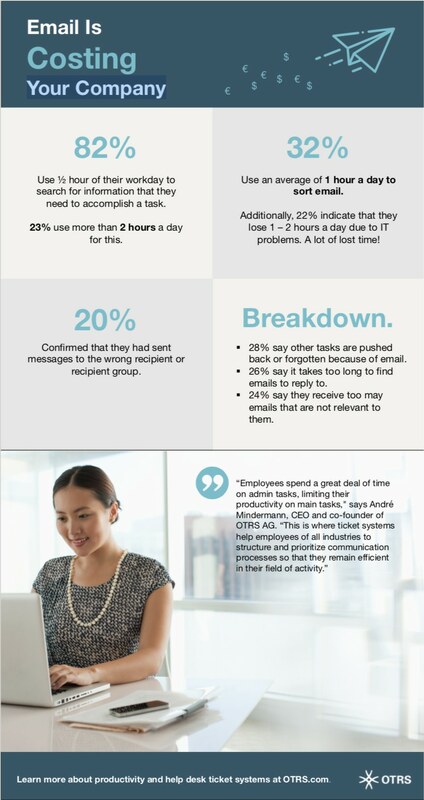 Because of the amount of email, other tasks are repeatedly pushed back or even forgotten (28 percent). It takes a long time to find an email to reply to (26 percent). Emails are sent to too many recipients for whom the information is not relevant (24 percent). When asked about the greatest related mishap in their everyday work, the largest portion of respondents (20 percent) confirmed that they had already sent an email to the wrong recipient or recipient group. As the study also shows, it is not only email that can cost a lot of time and prevent employees from working efficiently, but also IT problems: over 22 percent indicate that they lose one to two hours per day due to this. More information on how OTRS helps companies save time and money on administrative tasks can be found here.